A wakatō, as seen at the top of this page, is a foot-soldier or foot-man. It turns out that the play Godairiki Koi no Fūjime was important in the history of kabuki. Samuel L. Leiter in his book Historical Dictionary of Japanese Traditional Theatre wrote on page 20: "There was considerable interchange between Kamigata and Edo. In the 1790s, Sawamura Sōjūrō III (1753–1801) came to Edo with the playwright Namiki Gohei (1747–1808) and starred in Godairiki Koi no Fūjime, enormously influencing the Edo approach playwriting and the arrangement of a kabuki program. 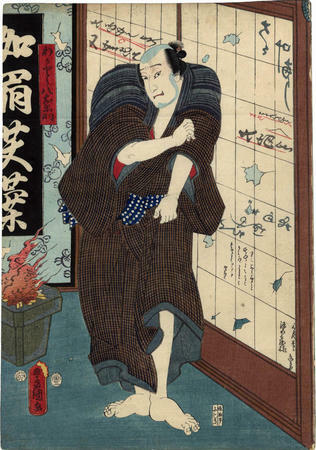 By this point, nearly 200 years after the Edo period had begun, kabuki reached a stage of perfection, but its once-youthful drive had begun to diminish and a period of stagnation was looming." This play, like so many others, is loosely based on a real love, jealousy and crime story of five people murdered in Sonezaki.